Many cities have turned the sites of World’s Fairs into public places that have endured through the decades. Chicago’s Jackson Park and the Midway were greatly upgraded after their use in the 1893 World’s Columbian Exposition. The odd-looking Sunsphere, a highlight of the Knoxville World’s Fair in 1982, is now the city’s most recognizable monument. Nashville has its Parthenon, San Francisco the Japanese Tea Garden. And perhaps the most famous souvenir of all — Seattle’s Space Needle. These are treasured and maintained relics of World’s Fairs of yore. 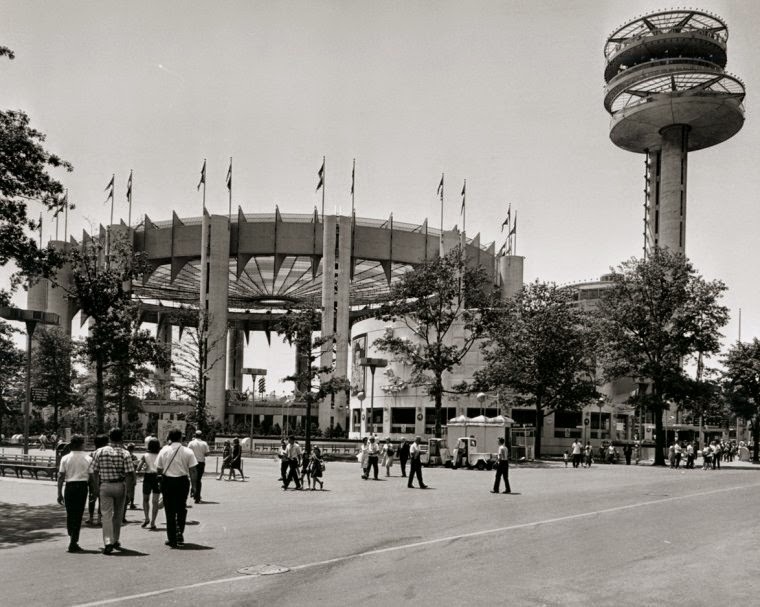 So what’s going on with the New York State Pavilion in Flushing Meadows-Corona Park? Like a few other extant relics, this holdover from the New York’s World’s Fair 1964-65 (designed by Philip Johnson and Lev Zetlin) was built to embody the future — two towers straight from the Jetsons and a once-festive coliseum perfect for robot gladiator games. The fair is long gone, but these structures remain, rusting and completely unused. Modern Ruin from Matthew Silva on Vimeo.